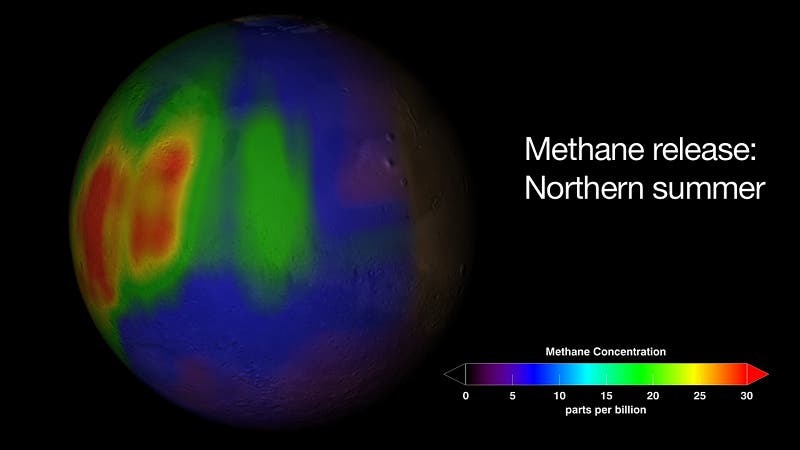 Mars’ Methane Debate Rages –A Sign of Life or a Mirage? Observations over the last decade suggest that methane clouds form briefly over Mars during the summer months. The discovery has left many scientists scratching their heads, since it doesn't fit into models of the martian atmosphere. The image above shows a map of methane concentrations in Autumn (first martian year observed) overlayed on true colour map of Mars. "The reports are extraordinary," says Kevin Zahnle of NASA Ames Research Center. "They require methane to have a life time of days or weeks in the martian atmosphere, which disagrees with the known behavior of methane by at least a factor of 1000." 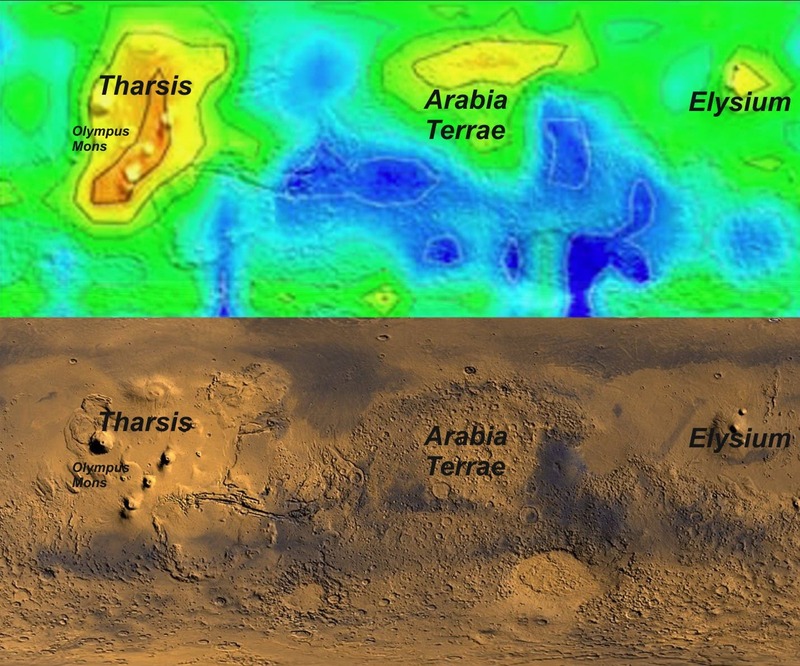 Zahnle and his colleagues have expressed some serious doubts about the existence of methane on Mars in a paper that appeared last December in the journal Icarus. "What we say is that the evidence is not nearly strong enough for us to suspend our trust in the known chemical behavior of methane," he says. "We stand by our results," says Michael Mumma of NASA's Goddard Space Flight Center, who leads one of the groups that made the methane observations. "True, the measurement is difficult, but it is not impossible." Mumma thinks the paper by Zahnle and his coauthors has been "a disservice," so he plans to write a rebuttal. "The community needs to understand the weakness of this argument," he says. For over 40 years, astronomers have found various hints of methane on Mars. These reports have always generated a lot of excitement because they seem to provide some clue to the habitability of our planetary neighbor. "Methane invokes visions of life on Mars," explains Sushil Atreya of the University of Michigan. This is because much of the methane on our planet comes from living (or once-living) things. But solid evidence of martian methane with infrared spectroscopy only surfaced eight years ago, in 2003, when Mumma and his group saw signatures of methane in spectra taken with the NASA Infrared Telescope Facility in Hawaii. The methane was localized into clouds, or "plumes," over certain regions of the Martian surface, with the maximum density of methane reaching about 60 parts per billion. In 2004, two other reports came out claiming to have seen methane. Data from the ESA's Mars Express, which began orbiting Mars in January 2004, showed signs of methane plumes, but not in the same places as Mumma's team. Another ground-based observation with the Canada–France–Hawaii Telescope detected methane, but it didn't have enough spatial resolution to see plumes. Mumma's group performed their own follow-up observations in 2006, when the orbit of Mars again allowed methane to be detected from the ground. But in the three-year interim, all signs of the methane had disappeared, as reported in a 2009 Science paper. The implication is that the methane is a seasonal occurrence, perhaps only coinciding with summers on the red planet. Mumma and his colleagues have estimated that the largest plumes on Mars would require a source that releases methane at rates comparable to the world's largest hydrocarbon seep, which is in California. Although thoughts turned to little methane-belching martians, geochemical processes could potentially produce these levels of methane on Mars. The jury is still out as to which of the various candidates is the most likely source. The harder nut to crack may be the rapid disappearance of methane on Mars. Models of the martian atmosphere estimate that a methane molecule should survive on average about 300 years before being destroyed by photochemical processes. However, analysis of the plume data suggests that methane is being removed from the atmosphere on the order of months, if not weeks. Zahnle and his colleagues have looked into how hard it would be to include a methane "sink" big enough to swallow up the observed methane plumes over such a short time. They conclude that any chemical process that devours methane would completely mess up the planet's chemical budget, in particular the allowance of oxygen. "Methane oxidation would exhaust Mars of its atmospheric oxygen in less than 10,000 years," Zahnle says. "Though the details of Zahnle et al’s theoretical arguments are debatable, their basic idea of the implausibility of large abundance and short lifetime of methane is fairly sound," Atreya says. Mumma is aware that his observations do not mesh with the established picture of Mars. "But a measurement is a measurement," he says. It's certainly possible that Mumma and others have found a "monkey wrench" that will require revising the current models of Mars, but Zahnle and others aren't convinced this is the case due to the difficulty in observing methane on Mars. According to their arguments, the spacecraft measurements suffer from poor spectral resolution that makes it difficult to detect the absorption lines that identify methane in a spectrum. The ground-based observations, on the other hand, have sufficient resolution, but they must contend with the Earth's atmosphere, which is full of its own absorption lines. To explain this last point further, imagine looking for a pink flower with rose-tinted glasses: the light that you want to see is absorbed before it gets to you. The signatures of martian methane typically lie in the infrared regions of the spectrum where our own atmosphere is highly absorbing. There are a few tricks that ground-based astronomers can use. For one, they can look at Mars when the planet is moving towards us or away from us. This causes a Doppler shift in the martian light that can make the methane lines a little easier to identify. Still, observers must build models to try and subtract away the "foreground contamination" coming from our atmosphere. This involves a careful accounting of all the molecules that may be absorbing incoming light. "The methane that [Mumma and others] see is not a raw measurement, but is rather a measurement filtered through a sophisticated but imperfect model of Earth's atmosphere," Zahnle says. He and his coauthors contend that these models may be incorrectly accounting for the effect of carbon-13 methane. Most methane in our atmosphere is made with carbon-12, but a small amount contains the heavier isotope carbon-13. The absorption lines for terrestrial carbon-13 methane just happen to lie right where Mumma's team claims to have detected the signature of martian methane. Zahnle's group doesn't think this is a coincidence. They argue that the carbon-13 methane is providing a false signal of martian methane. Mumma disagrees. He says if they were underestimating carbon-13 methane, then this false signal should show up in all of their processed data, but it doesn't. "You need a very sophisticated model to extract the terrestrial signal," Mumma says " "We think our multilayer models are the most advanced in the world for this region of the spectrum." Moreover, he says that the purported methane signal changes as they look at different regions on Mars. This kind of spatial variation wouldn't be expected if the signal were due to absorption in our own atmosphere. Mark Allen of the Jet Propulsion Laboratory has followed the debate and thinks Mumma has effectively rebutted the doubts about his group's spectroscopic analysis. Allen's own point of view is that the methane plumes that were visible in 2003 rapidly spread out to such an extent that the gas was no longer dense enough to be detected. "So methane doesn't disappear, à la having to have an unusually short chemical lifetime," Allen says. Atreya has a different take on the issue. He finds the claims of spatial and seasonal variations in the methane concentration to be "quite dubious." He believes that a relatively small quantity of methane has been observed, but the present data seem consistent with it being essentially uniformly distributed over the planet. truction or release mechanisms," Atreya says. Most of the community is being cautious and not taking sides in the debate, according to Atreya. They are hoping upcoming missions will decide who was right after all. The answer might come from NASA's Mars Science Laboratory rover, called Curiosity. It is scheduled to land on Mars in August 2012, carrying with it the Sample Analysis at Mars (SAM) suite, which will measure a multitude of trace constituents and isotopes from gas and solid samples. Two of the SAM instruments, the tunable laser spectrometer and the quadrupole mass spectrometer, could potentially detect a whiff of methane – at the 1 part per billion level or lower – in the air around the rover landing site at Gale Crater. A more comprehensive test is planned in 2016 with the ExoMars Trace Gas Orbiter (TGO), which will be part of the joint ESA/NASA dual mission ExoMars Program. The TGO will scan the atmosphere for exotic trace gases, such as methane. Allen says that many people assume that the only motivation for TGO is to confirm the presence of methane, but it will perform other important science as well. Zahnle questions whether all this effort to look for methane on Mars will be worth it in the end, "but given how the story has unfolded, it must be done."